Roscommon triumphed by five points in the game in Tuam. ROSCOMMON PUT FBD League titles back to back for the first time as eight points from Donie Smith gave Anthony Cunningham his first silverware as Roscommon manager. A week out from their Division 1 opener against Cavan, Galway only scored three points from play, while at the other end Roscommon impressed in attack in advance of their league clash with Mayo. Barry McHugh hit a goal for Galway early in the second half to level matters but Roscommon pulled clear in the closing stages in a repeat of last season’s final. The game was marred by the countless cards handed out, with Galway sub David Wynne sent off in added time, while four black cards and 13 yellows were also shown in an ill-tempered affair. Galway started the first half with a very strong wind at their backs, but it was Anthony Cunningham’s side that got off to the brighter start. Only three minutes had passed when Shane Killoran curled over a point off his left from the left wing, and a minute later Donie Smith clipped over a free to double their lead. Things could have got much worse for Galway in the fifth minute, but Ruairí Lavelle did well to smother Enda Smith’s shot. Galway looked laboured in attack early on and their first score didn’t materialise until Shane Walsh finished off a sweeping counter attack with a point. Gary O’Donnell added another good score for Galway from the right to level matters in the 19th minute, but from there to the interval it became a tetchy affair. 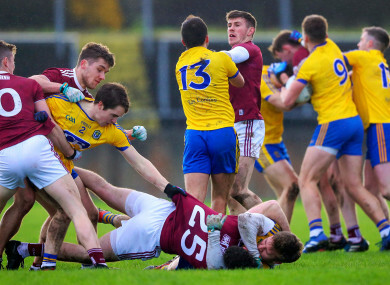 O’Donnell was black carded after 20 minutes for a pull down on Ronan Daly, and with the Galway wing back in the sin bin Roscommon benefited with three points in a row to open out a 0-5 to 0-2 lead, two of which came from impressive full-forward Ciaran Lennon. Three minute from the break a mass brawl erupted, which resulted in yellow cards for Barry McHugh and Evan McGrath, and a minute later Ciaran Duggan was sin binned for pulling down Enda Smith. Either side of that incident Galway added points from O’Donnell and McHugh, but after Eoghan Kerin was booked, Roscommon made it 0-6 to 0-4 at half-time when Donie Smith cut back on his left to score. Donie Smith landed the first score of the second half four minutes after the restart, but as the half progressed Galway grew back into the game. A couple of missed frees from McHugh halted Galway’s progress, but when McHugh and Gareth Bradshaw twice exchanged passes, McHugh rattled the net for the levelling goal. Ultan Harney pointed on the counter to put Roscommon ahead after 48 minutes and Colin Compton doubled the lead moments later, before a Donie Smith wiped out the goal with a third point in a row. Roscommon were four points up and a super save from O’Malley denied Ciaran Duggan five minutes from time and it was an easy run to the finish for Roscommon. Scorers for Roscommon: Donie Smith 0-8 (0-5f), Ciaran Lennon 0-2, Shane Killoran, Ultan Harney, Colin Compton 0-1 each. Scorers for Galway: Barry McHugh 1-1 (1f), Shane Walsh (0-1f), Gary O’Donnell 0-2 each. Email “13 yellow, 4 black and one red card shown as Roscommon retain FBD League title”. Feedback on “13 yellow, 4 black and one red card shown as Roscommon retain FBD League title”.